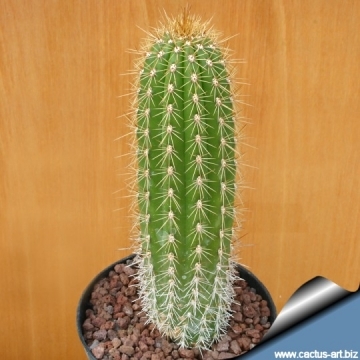 is a multi-stemmed columnar cactus that branch profusely at the base; branches ascending parallel with the main stem. Up to about 2 m. The blooms are very showy. Origin and Habitat: Western Argentina, Bolivia. 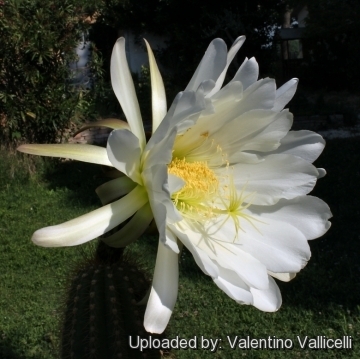 Description: Echinopsis spachiana is a multi-stemmed columnar cactus at first simple, later profusely branching at the base; branches ascending parallel with the main stem. Stem: Stem upright up to about 2 m tall, but usually smaller, 5 to 6 cm in diameter, columnar. Ribs: 10 to 15, obtuse, rounded. Areoles: About 1 cm apart, large, covered with curly yellow wool, turning white or grey as they age. Spines: Radial spines 8 to 10, 6 mm to 1 cm long, spreading, stiff, sharp, amber-yellow to brown. Central spines: 1 to 3 yellowish, 12 mm long, stronger and longer than the radials; all the spines later becoming grey. 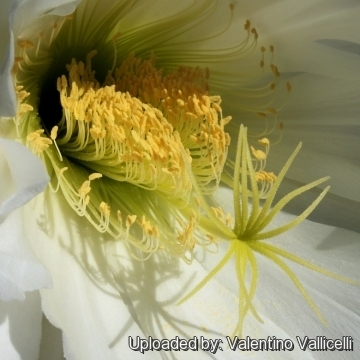 Flower: Nocturnal, white, about 20 cm long and 15 cm in diameter lasting about 24 hours from one sunset to the following one. 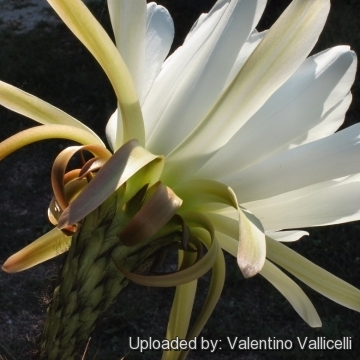 Echinopsis spachiana (Lem.) 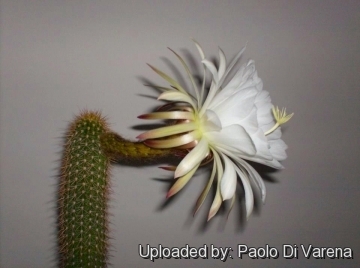 H.Friedrich & G.D.Rowley: is a multi-stemmed columnar cactus branching at the base. Stems to 2 m tall, 5 to 6 cm in diameter. Spines spreading, amber-yellow to brown c. 1 cm long. Distribution Western Argentina, Bolivia. 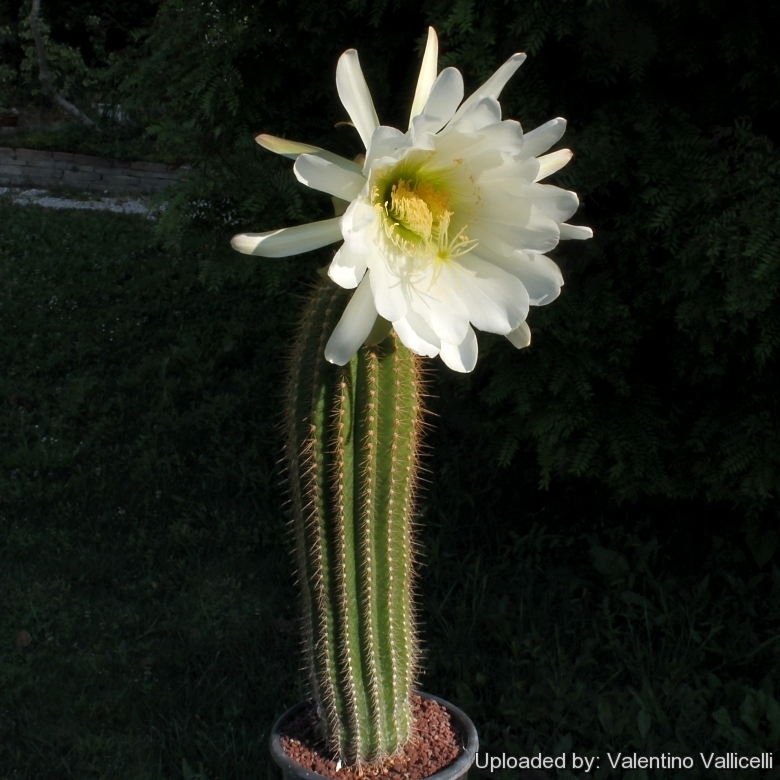 Cultivation and Propagation: Echinopsis spachiana is a a much decorative frost hardy cactus easily found in cultivation and grows virtually anywhere. It is a summer grower species that offers no cultivation difficulties. It can be overwintered outdoors if sheltered from rain and severe frosts. Water: In summer, during the vegetative period, it must be regularly watered, but allowing the substratum to completely dry up before irrigating again (but do not overwater). In winter, it’s to be kept dry. Preferable not to water on overcast days, humid days or cold winter days. 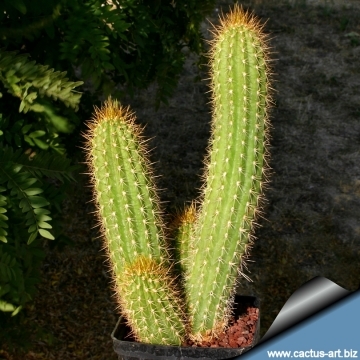 Hardiness: It is a quite frost resistant cactus, hardy to - 10° C (or less if very dry). However in cultivation it is better not to expose it to temperatures lower than -0° C, even if in an aerated and protected location, in order to avoid the formation of anti-aesthetic spots on the epidermis. In presence of high atmospheric humidity avoid any frost as it is particularly sensitive to root rot. 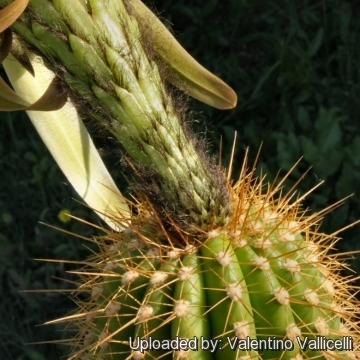 Grafting stock: Trichocereus spachianus is often used as a rather thick stock.